Erin Bowkett has an MSciComm (Master of Science Communication) and a background in biology and conservation. She currently works at ADInstruments as an instructional designer. She has a keen interest in birds and enjoys bringing science and the public together. Catriona MacLeod is an ecologist for Landcare Research based in Dunedin, New Zealand. Her research focuses on biodiversity indicators of sustainable land management and the community and population dynamics of birds. Eric Spurr is a retired Landcare Research ecologist, now Research Associate. He is the founder and organizer of the New Zealand Garden Bird Survey. Nancy Longnecker is a Professor of Science Communication. Her current research looks at factors that affect people’s attitudes towards science-related issues and aims to improve impact of science engagement. As citizen science inherently relies upon unpaid contributors, providing a positive experience for participants is critical. This case study describes the use of social media to support participants of the New Zealand Garden Bird Survey and examines the group’s interactions in its first year through the lens of a community of practice. Communities of practice can provide forums for learning, which is an important outcome of participation by environmental volunteers. Social media can provide the setting for an online community of practice that can support dispersed groups of volunteers and requires little daily input from administrators. 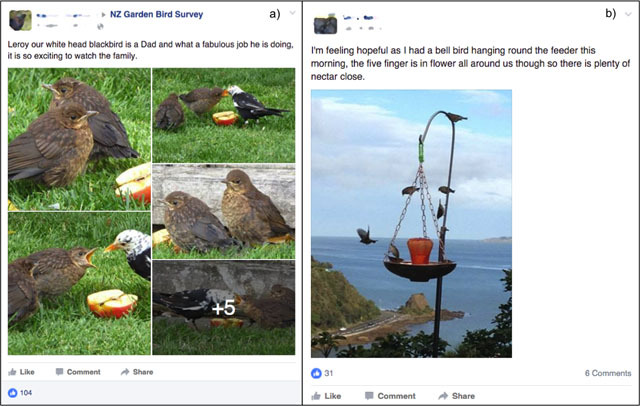 While the NZ Garden Bird Survey runs for only nine days annually in June–July, this Facebook group continued to be active and attract new members throughout the year. In the first year of its existence, the group grew to 1,275 members who generated nearly 75,000 interactions (posts, comments, likes, and shares). The group was used to share enthusiasm, ideas, and knowledge about New Zealand’s garden birds. A wide range of birding expertise, from novice to expert, was displayed. The group’s interactions include shared interests, contributed stories, and collective learning. This paper documents our experiences setting up and administering this group and provides advice for citizen science programs that want to use social media to support a community of practice. The past 20 years have seen a global increase in citizen science projects and interest in their facilitation (Bonney et al. 2014; Peters et al. 2015). The definition of citizen science used here aligns with Roy et al.’s (2012) description of “involvement of volunteers in science” (p. 5). Citizen scientists have enabled collection of data over vast areas and long time spans, and made contributions to conservation, monitoring (Bonney et al. 2009; Dickinson et al. 2012; Peters et al. 2015) and to knowledge about birds (Greenwood 2007; McCaffrey 2005; Snäll et al. 2011). Increased availability and use of online technologies expands opportunities for citizen science, with increased ease of data entry and precise measurements of location. Citizen science is not without challenges, however. Building and maintaining engagement amongst participants requires ongoing effort and resources (Bell et al. 2008; Silvertown et al. 2013; Geoghegan et al. 2016). One way to address these challenges is to create a supportive community that encourages engagement and learning. Providing participants with ways to interact and communicate with both project coordinators and other participants has several benefits (Jennett and Cox 2014; Tinati et al. 2015). This paper describes the use of social media to support and encourage a diverse range of volunteer participants. We outline steps taken to establish an active and supportive Facebook group for the New Zealand Garden Bird Survey and we advance a framework for discussing and understanding interactions within the group. This work is one part of a larger study exploring the group’s demographics and interactions. The New Zealand Garden Bird Survey (NZ-GBS) started in 2007 and occurs annually over a nine-day period in June and July during the New Zealand winter (Spurr 2012). Volunteer participants observe their garden for one hour of their choosing and record the highest number of individual birds present at one time for each species. NZ-GBS is supported by Landcare Research (a New Zealand Crown Research Institute) and aims to provide a snapshot of garden bird populations across New Zealand to monitor changes and inform management strategies for native and introduced birds. Birds are especially important within the context of New Zealand’s natural history. In evolutionary terms, the islands that make up the country had no land-based mammals except bats, which led to a terrestrial ecosystem dominated by birds, a large percentage of which are endemic and now threatened with the introduction of mammalian predators (Craig et al. 2000). The uniqueness and predominance of New Zealand’s birds has given them special status within New Zealand’s cultural identity (Star 2002). On average 4,777 people across New Zealand participate in the NZ-GBS each year. Providing face-to-face support or training for such a widespread group of volunteers is logistically difficult. Social media, however, can create a virtual space where participants can learn from each other and share stories, ideas, and experiences. Social media also allows participants to stay engaged with NZ-GBS and each other throughout the year, a challenge for once-a-year citizen science efforts. Prior to the NZ-GBS Facebook group, participants had no means to share their stories and discoveries directly with the wider NZ-GBS community. Letters and emails written to one of the authors suggested that some participants were interested in doing so. Organizers were aware of the limitations of using a government organization’s website for informal communications. A virtual community was established to address these concerns. With 91% of New Zealanders reportedly active Internet users (Crothers et al. 2016), a virtual community can be accessible to most participants of a citizen science project. Facebook is a useful platform for creating a virtual community because its layout encourages participants to interact directly with each other in a way that other social media platforms, such as Instagram and Twitter, do not. It is also currently familiar and widely used. Facebook is the most popular social media platform in New Zealand, with 75% of the web-connected population aged 15+ using the site (Nielsen 2016). Facebook is the fourth most-visited website in New Zealand behind Google.co.nz, Google.com, and YouTube.com (Alexa 2016). Comparatively, in 2013, usage rates of Facebook, Twitter, and Instagram in New Zealand were 53%, 8%, and 7% respectively (Adcorp 2013). While the NZ-GBS also has a Twitter account and Instagram hashtag, communication through these channels does not attract the same level of interactivity as the Facebook group. Facebook is also preferable to a separate online forum, which would require people to check for communications on another platform. Because information from a Facebook group is coming through a channel that most participants are already using, it can allow easy engagement. Learning is a valued benefit of volunteering (Bruyere and Rappe 2007; Grese et al. 2000; Stepenuck and Green 2015). Volunteers provided with learning opportunities are more likely to continue volunteering (Ryan et al. 2001). After reviewing 14 citizen science programs, Bela et al. (2016) concluded that learning outcomes should be intentionally incorporated into citizen science. Masters et al. (2016) showed that fully online citizen science programs (“citizen cyberscience”) with strong communication and public engagement strategies (e.g., blogs and online chat forums) are more strongly characterized by active participation and learning outcomes than those without. Price and Lee (2013) advocate for finding new ways to support citizen scientists by creating online forums to support collaborative learning; they found that participants attributed much of their learning to interactions within the social forums connected to a citizen cyberscience project. Jennett et al. (2016) found that “learning in citizen cyberscience tends to be informal, unstructured and social” (p. 15). They describe a cycle of learning in online citizen science programs. When novices join, they learn by participating in the task, sharing their experiences, and asking questions in the associated online forums. This sharing and learning helps novices develop confidence in their skills and acquire expertise. With increasing competence and confidence, they offer help to other newcomers. Assisting others can consolidate learning and make participants more aware of their learning, highlighting the value of continued participation (Jennett et al. 2016). For people in free-choice learning communities, resources that are available as needed are appreciated and used (Liu and Falk 2014). An active social media community built around a citizen science program provides a resource for on-demand learning. Community of practice (CoP) is a term coined by Lave and Wenger (1991) to describe a group of people coming together around a particular topic who share knowledge, ideas, and excitement about that topic. CoPs have three central characteristics: A domain or shared interest; a community of people who share and learn collectively; and a practice or set of common resources, stories, and tools (Wenger et al. 2002). Ongoing interactions in a CoP enable participants to deepen knowledge and develop expertise (Wenger et al. 2002). Originally studied in the field of education (Lave and Wenger 1991), CoPs are also prevalent within health (Nicolini et al. 2016; Ranmuthugala et al. 2011) and business arenas (Li et al. 2009; Wenger et al. 2002). While CoPs originally revolved around in-person meetings, social media provides a platform for virtual communities (Gunawardena et al. 2009; Johnson 2001). CoPs based within businesses can attract and retain employees (Wenger et al. 2002). They allow for sharing knowledge and expertise in ways that can increase creativity and organizational performance (Lesser and Storck 2001; Wenger et al. 2000). A review of CoP use in healthcare revealed facilitation of sharing information, reduced feelings of isolation, breaking down professional barriers, and increased competency, especially at the novice level (Ranmuthugala et al. 2011). We explored CoPs as a way to engage and support volunteer participants for a citizen science program, while at the same time providing learning opportunities. Social media-based CoPs are not new (Gunawardena et al. 2009; Johnson 2001). In higher education, social media-based CoPs can enhance social learning opportunities and students’ sense of community (Hung and Yuen 2010; Sullivan and Longnecker 2014) as well as provide a valuable forum for sharing local knowledge (Gray 2004). Social media-based CoPs add particular value for distance learners or a dispersed group of students (Mayes and de Freitas 2007), newcomers (Gray 2004), and those engaged in self-directed learning (McLoughlin and Lee 2010; Gray 2004). While CoPs supporting citizen science programs have the potential to encourage transformative (social) learning (Bela et al. 2016), relatively few studies of CoPs exist in the environmental arena or regarding the use of social media to support citizen scientists (Triezenberg et al. 2012). The NZ-GBS provides a good case study for examining online support of citizen science. In the next section, we provide an overview of the development of the NZ-GBS Facebook group to give context for the analysis that follows. We then consider interactions in the NZ-GBS Facebook group using the CoP conceptual framework of Wenger et al. (2002). A Facebook group was established on 27 May 2015 with the authors and a web administrator from Landcare Research serving as the group’s administrators. Once established, the group was monitored for its first year. Working with an existing platform like Facebook requires working within its constraints and formats. At the time of writing, Facebook pages allow for dissemination of information, but can display only posts being generated or shared by its administrators. In contrast, Facebook groups allow any group member to post, like, or comment (Figure 1). Therefore, they allow direct interactions among members, which are a necessary component for a CoP. Example post from NZ-GBS Facebook group with definitions of Facebook terminology. Group administrators can select from three levels of access (public, closed, or secret) and decide whether an administrator must approve membership requests. Because we wanted to minimize barriers to participation we selected a public group; this means that anyone with a Facebook account can see all content. Non-members are able to interact with the group by liking and sharing content, but only members can post content of their own or comment on existing posts. An overview of the group was posted to provide general information about NZ-GBS, resources for more information about the project, and instructions for contacting administrators. A disclaimer states that opinions expressed within the group do not represent NZ-GBS or its hosting organization, Landcare Research. The group was advertised via an existing email list of 8,756 addresses, including previous NZ-GBS participants and other interested individuals and organizations. A link to the group was posted on the NZ-GBS website and has subsequently been included in NZ-GBS communications sent out by Landcare Research. Information about the group has been presented to special interest groups and stakeholders, at conferences, in radio interviews, and through social media channels of other NZ conservation organizations. Members also are recruited via group content shared on members’ personal Facebook pages. Based on social media market research (Salesforce.com Inc. 2013), a schedule of posts was developed before the launch of the group to keep the group active and set the tone with examples of appropriate content. Posts were created from perspectives of both novice and expert birders to signal that any level of expertise was welcome. Initially, 37 posts were created and scheduled for release over the first seven weeks. The group quickly developed momentum of its own; with the rapid growth of participation, some planned posts were deemed redundant and not made. The six administrators jointly managed the Facebook group. Having multiple administrators improves the ability to respond quickly to requests to join, requests for assistance, or reports of inappropriate content. Requiring administrator approval to join helped minimize junk content. All requests to join were briefly investigated to verify that they came from genuine individual profiles. A quick look at an individual’s profile (e.g., where they are from, their Facebook join date, and the number and type of group memberships) is usually sufficient to verify a genuine account. Over the year, more than 200 membership requests (14%) were made from questionable profiles and were declined, confirming the importance of administrator approval. Administrators aimed to create a positive and supportive tone from the start, to provide a welcoming forum for all garden bird lovers. Setting the tone with planned posts early on likely helped to establish a basis for conduct. Research in virtual communities has shown that repeated exposure to a particular behavior drives the development of social norms for the group, and that through their interactions, group administrators can influence certain member behaviors and attitudes (Bateman et al. 2006). The ratio of positive to negative affect is a key predictor in whether a group flourishes or languishes; positive actions breed positive actions (Fredrickson and Losada 2005). Early in the group’s development, one individual made a handful of posts and comments that had a negative tone. In response, a Terms of Engagement document was drawn up which reiterated the purpose of the group and the need for respectful discussions. The document gave tips on how to manage one’s individual Facebook feed and report inappropriate content to administrators. This laid the groundwork for future removal of any member deemed to violate the terms, and has been useful to remind participants that interactions must remain respectful. Contentious topics arise on occasion, requiring moderation. One example was a discussion surrounding an aerial release of the toxic bait 1080 (sodium fluoroacetate), used by New Zealand’s Department of Conservation to control invasive mammal species for the protection of native birds. One post highlighted perceived negative effects of the toxin, which set off a lengthy discussion that included the only instance we have seen in this group where an individual was harassed on a personal level. The member responsible for the harassment was removed from the group; he was told he could re-join provided he agreed to the aforementioned Terms of Engagement, which he did. This example is one of only six instances during the year when a conversation was moderated. Because the NZ-GBS Facebook group is a “public” group, all content is freely visible online. As it is in the public domain, it is available for researchers to examine without approval from an ethics committee or participant consent. Both data collection methods described below were at the time of data collection free and available to anyone with a Facebook account, whether or not a member of the group. To respect privacy we have blanked out names of group members from figures; our examination and description of content is respectful and does not compromise any participant. Approval has been given by photographers for the use of all photographs displayed in figures. The authors monitored the NZ-GBS Facebook group regularly, taking screenshots of interactions of interest. Membership requests were recorded by acceptance date, and declined memberships were logged. While Facebook has a data collection system for participation statistics, its use at the time of data collection was limited to pages and not available for groups. Data were therefore collected using the Netvizz v. 1.3 data extraction application (Rieder 2013). Netvizz collects content from posts, comments, and replies to comments, with anonymous codes for individual users. Post type is reported as one of five categories: Status (text only), photo, video, link, or event. Data are also collected on the timing of each post or comment, number of likes generated by each post or comment, and number of shares. Posts made between 27 May 2015 and 26 May 2016 were downloaded using Netvizz on 13 June 2016, a date by which all posts would have generally stopped gathering likes and comments. Content analysis of posts and comments is being conducted and reported separately. An additional analytics tool, sociograph.io, was used to gather information about the interactions of individual contributors including how many times each member posted, commented, or liked. Both Netvizz and sociograph.io have limitations as data collection systems which can lead to differences in the number of posts, comments, likes, and shares reported by each program. Both tools use Facebook’s application programming interfaces (API) to gather data, and the data gathered for each request are dependent upon many factors including Facebook’s frequently updated interface and default profile settings, each individual’s group membership status, and group members’ privacy settings at the time of the data retrieval (Rieder et al. 2015). Accuracy of the precise number of shares is compromised, because the way that shares were reported via the Facebook API changed during the year. While this dataset may not, then, be a complete set of all posts, likes, comments, and shares, we are confident that trends discussed here provide an accurate depiction of the group. In its first year, the NZ-GBS Facebook group became a thriving online community, growing to 1,275 members. While the highest spike of membership requests came during the lead-up to the 2015 NZ-GBS, membership requests continued throughout the year. An average of 25 members were added each week (minimum = 1, maximum = 287). While Facebook does not report the number of members leaving a group, a comparison of accepted membership requests (n = 1,352) to total group membership suggests member turnover of around 6%. Anecdotal evidence within the group suggests that the group contains people who avidly participate in the NZ-GBS and those who have never participated before and is mainly composed of older New Zealanders. It is not possible to report on the demographics of the Facebook group members because Facebook’s analytics program was not available for groups. These analyses are part of ongoing research and will be reported in other publications. Over the year, members contributed a total of 2,319 posts; these generated 13,521 comments, 57,725 likes, and 1,424 shares for a total of 74,989 total interactions (Figure 2). The daily average was six posts (minimum = 0, maximum = 28) and 205 total interactions (likes, posts, comments, and shares; minimum = 0, maximum = 1,147). The average post generated 32 interactions (minimum = 0, maximum = 317). Interactions peaked during the 2015 NZ-GBS, but remained high throughout the year. NZ-GBS Facebook group total number per week of posts and shares (a, top), comments and likes (b, below), from 27 May 2015 to 26 May 2016. The annual NZ-GBS began in week five and ran 28 June–5 July 2015. A large proportion of members contribute. About one in four have contributed a post, and 51% of members have contributed at least one comment. A total of 1,657 individuals have liked content in the group, a figure that exceeds total membership (1,275). This is possible because people can like content without being a member. Members post, like, comment, and share a variety of content (Figure 3). More than two-thirds of posts contained photographs (n = 1,685; 72%), making photos the most common type of shared information. There were 436 status (text only) posts (19%). A smaller number of posts included videos (n = 110; 5%) and web links (n = 99; 4%). Examples of post types from the NZ-GBS Facebook group: a) photograph b) web link and c) status or text-only. Is the NZ-GBS Facebook group a community of practice? To assess what is happening within the group, we now look beyond numbers. The framework of community of practice (CoP) was chosen for conceptualizing and analyzing the group’s interactions (Wenger et al. 2002). The NZ-GBS Facebook group exhibits all three core CoP characteristics of a shared domain or topic, a community of people who share and learn collectively, and a practice or set of common resources, stories, and tools. The NZ-GBS Facebook group’s domain is identified as New Zealand garden birds, as outlined in the group’s overview and Terms of Engagement. This is the domain around which all interactions are centered, and appreciation of garden birds is part of a shared identity of group members. Posts and comments generally stay well within the established domain. However, a wide range of both native and introduced, common and rare bird species is highlighted, as members’ interests in birds are not limited to garden birds. Occasionally, content appearing on the site has included birds or bird news from elsewhere in the world, as well as more tangentially bird-related topics such as New Zealand’s large-scale pest eradication program, plant or insect identification, and sightings of non-bird wildlife. The NZ-GBS community is a self-selected group that chooses to discuss New Zealand garden birds within the setting of a Facebook group. There is evidence for collective sharing and learning in post and comment content. Members have used the group to share knowledge and expertise on a wide range of topics (Figure 4) including identification, feeding and feeders, camera settings for capturing birds in flight, disease identification, and the impact of cats on bird populations. 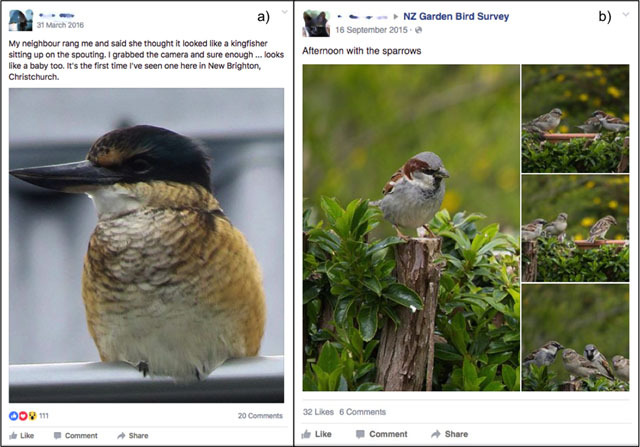 NZ-GBS Facebook group posts that demonstrate collective sharing and learning: a) avian disease identification b) general bird identification c) bird and garden interactions. While the group was originally envisioned as a CoP specifically focused around the practice of collecting data for the NZ-GBS, it quickly expanded to encompass support for New Zealand garden birds more broadly. Group content reveals shared resources that include a wide range of books and websites, as well as members’ personal photographs, experiences, expertise, and stories. Members also share information on other bird-related citizen science programs and volunteer opportunities. The seven principles for cultivating a CoP of Wenger et al. (2000) are discussed in the following sections in relation to the NZ-GBS Facebook group and interactions within it. This principle ensures that a CoP can grow and change as membership or focus shifts over time. Wenger et al. (2002) suggest beginning a CoP by building upon existing groupings or networks of people. The NZ-GBS Facebook group was created and promoted within a network of previous NZ-GBS participants and grew from there. It is important to allow a community to be dynamic and define its own interests. The group has largely developed on its own with minimal intervention from administrators. Any shifts or changes in focus have been participant-driven and unmediated as long as conversations are respectful and relevant to NZ garden birds. The opportunity to learn can be an important motivator and benefit for environmental volunteers (Alender 2016; Ryan et al. 2001). Members of the NZ-GBS Facebook group range from “outsiders” (birding novices) to “insiders” such as experts in bird-related fields, including wildlife rehabilitation specialists and scientists at universities, NZ-GBS’s hosting organization, and the New Zealand Department of Conservation. This range of member expertise and experience ensures that there are novice questions (e.g., basic identification or feeding) as well as expert discussion (e.g., identification of avian diseases and genetic mutations, Figure 4). The opportunity to share knowledge and expertise with others can be important to experienced environmental volunteers (Measham and Barnett 2008). The confluence of multiple knowledge types in the NZ-GBS Facebook group allows for diverse discussions and provides opportunities for less-experienced members to learn and develop expertise. Not all conversations in a CoP need to take place in public. Members of the group can communicate via public group posts, but also have Facebook’s private chat feature available, providing access to public and private community spaces. Administrators have used this function to allow a handful of private discussions with group members. As conversations between members cannot be tracked, we do not know whether this feature is used by others in the group, and if so, how often. Conversations within particular posts are public but may be limited to a few individuals around a specific topic, being location-specific (e.g., reporting banded birds in an area restricted to the general public) or focused on a narrow topic of interest (e.g., camera settings and lenses or questions about data cleaning for NZ-GBS reports). Facebook easily enables different levels of participation through the ways in which individuals can choose to interact with the group, from actively posting or commenting to more passive liking or simply observing. Providing a range of participation levels is important so that all members can find their place within the group. Multiple levels provide ways for individuals to interact in a style that suits their time, ability, interest, and comfort. The group generated nearly 75,000 interactions (posts, comments, likes, and shares) in its first year. 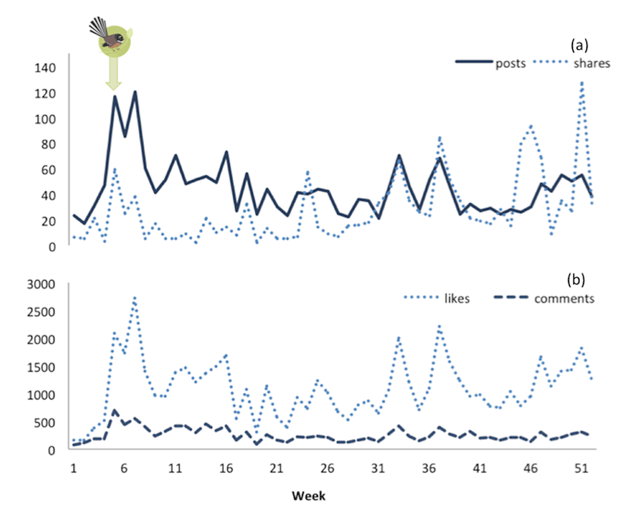 Three percent of all interactions come from posts (n = 2,319) and 2% from shares (n = 1,424) while 18% of interactions take the form of comments (n = 13,521). Unsurprisingly, the largest proportion of interactions comes from likes, which is the easiest interaction option (77%, n = 57,725). Wenger and Wenger-Trayner (2011) outline five levels of participation by members of a CoP – core, active, occasional, peripheral, and transactional – which we have adapted to encompass different types of Facebook interactions (Table 1). Placement into these levels depends upon the type(s) of interaction in which members engage, not their frequency of interaction. Five levels of participation in a CoP, adapted for a Facebook setting and outlining the number and percentage of individuals in each level for the NZ-GBS Facebook group (total membership = 1,275). * Shares are not recorded on an individual basis by the analytic software used, and thus are not included in calculations. ** Percentages add up to more than 100 because people can like group content without being a member, and some individuals whose activity has been recorded are no longer members. Wenger and Wenger-Trayner (2011) define core members as those who “energize and nurture the community.” Within the NZ-GBS Facebook group, core members are those individuals who create content and drive group focus by posting (Table 1). One of the strengths of this use of social media is that group members take it upon themselves to contribute and drive the group focus. This provides an opportunity for program coordinators to discover more about concerns and interests that participants may have. 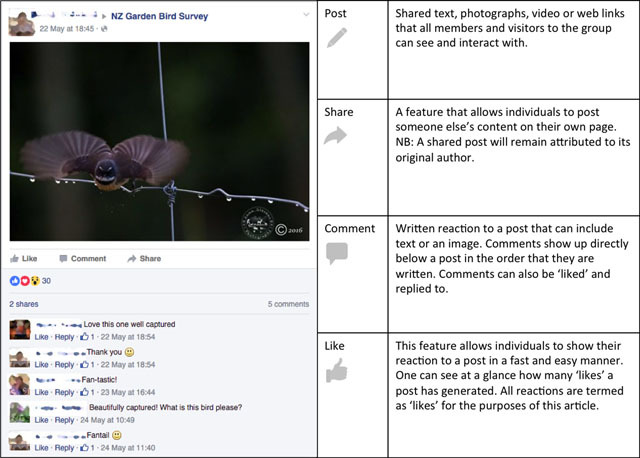 Whether and how this NZ-GBS Facebook group is enabling participation in science and conservation is being explored separately using content analysis of posts and comments. Active participants help to define the community with their interactions, but are not as engaged in driving the discussion as core members. In this adaptation, active members are individuals who respond to and contribute comments on existing content, but do not create their own posts. Participants who share NZ-GBS Facebook group content to their own individual profiles also might be included at this level. However, because the sociograph.io software does not record shares made by each individual, the number of members who interact in this way remains unknown. Taken together, the core and active groups contain the majority (53%) of NZ-GBS Facebook group members. Occasional contributors encompass those whose highest level of interaction within the group is a “like.” It is unsurprising that this easiest Facebook interaction level is also the largest. The number of occasional contributors, combined with membership of the previous two levels, exceeds the total number of NZ-GBS group members. This is likely because 1) some people who have previously interacted have left the group and so are not counted in the end-of-year membership tally, and 2) people can like group content without being a member. Although the exact number of external occasional contributors is not discernible, at least 293 individuals who have interacted with the group are not currently members. Peripheral participants are members of the group who choose not to interact in a measurable way, while transactional participants describe external, non-group members who may check in from time to time. Because members at these levels leave no record of their presence, it is not possible to separate or quantify them at this time. It should not be assumed, however, that these observers, or “lurkers,” gain nothing from their membership or observations. Research on reasons for lurking in online communities found that most lurkers (54%) report getting enough from the group by reading and browsing alone (Nonnecke et al. 2006). Other reasons for lurking included wanting to learn more about the group before participating (30%), being shy about posting (28%), and reportedly having nothing to offer (22%). If members of the NZ-GBS Facebook group did not value its content, the group would not exist. After the annual 2015 survey period, some members speculated that the group might be shut down until the following year’s survey. One post from that timeframe reads, “Even though the survey is officially over, I really hope this page keeps going – it’s fabulous to see who’s flying around in each other’s garden – I learn something every day!” Wenger et al. (2002) stress the importance of not only finding value in a CoP, but also having members openly express the value they find. They argue that value is dynamic and changes over time. Value can be difficult to define, but once expressed, can help others in the group become more aware of the things they also value, confirming the social norms of the community and elaborating shared meaning. A group member is more likely to find value while participating in a group that aligns with their identity. Reminders about value of participation may keep individuals active and engaged. A combination of familiarity and excitement is achieved in the NZ-GBS Facebook group through the diversity of content. Shared images reveal both birds that are common and those that may rarely be seen (Figure 5). The response generated from posts with exciting content is clear. One post that featured a garden visit from a rare North Island saddleback (Philesturnus rufusater) generated 120 likes and 14 comments (134 total interactions, compared to an average of 32 interactions/post). Examples of exciting content a) sacred kingfisher (Todiramphus sanctus) and familiar content b) house sparrow (Passer domesticus) exhibited on the NZ-GBS Facebook group. Discussion topics also range from familiar to exciting. Some queries are common, including questions on bird identification and discussions about what and when to feed birds. When less-common discussion threads come up, they can generate a lot of interest; examples include a live video feed of a kākā’s nest (Nestor meridionalis), New Zealand’s pest eradication schemes, control of pet and feral cats, and whether humans should feed birds at all. Discussions along the familiar-to-exciting spectrum are important for keeping people interested and engaged with the group. Wenger et l. (2002) contend that exciting content initially attracts new members and plays a vital role in keeping a CoP active. Familiar content is especially important to newcomers, as it can serve as an easy entry point for participation in conversations. It may be unfamiliar content, however, that drives excitement in the group. Everyone can share delight and enthusiasm at the visit of a rare bird to a garden. Group rhythms promote familiarity and routine, which can foster participation. Regular postings generate ongoing activity, which encourages members to stay connected to the group. Rhythm exists on many levels within this particular CoP. The community has created a rhythm for itself in the timing and frequency of posts. Many posts are made in the afternoon, with 43% of posts made between 12–5pm, and typically they are made fairly evenly throughout the week. It is easy for individuals on Facebook to create a rhythm for their own access and interactions. An obvious anchor for the NZ-GBS Facebook group’s calendar is the annual NZ-GBS survey period each winter. During the particularly active month that encompasses the 9-day survey, much of the increase in postings (Figure 2) related to the survey itself, with queries and information on how and when to participate and encouragement for people to take part. 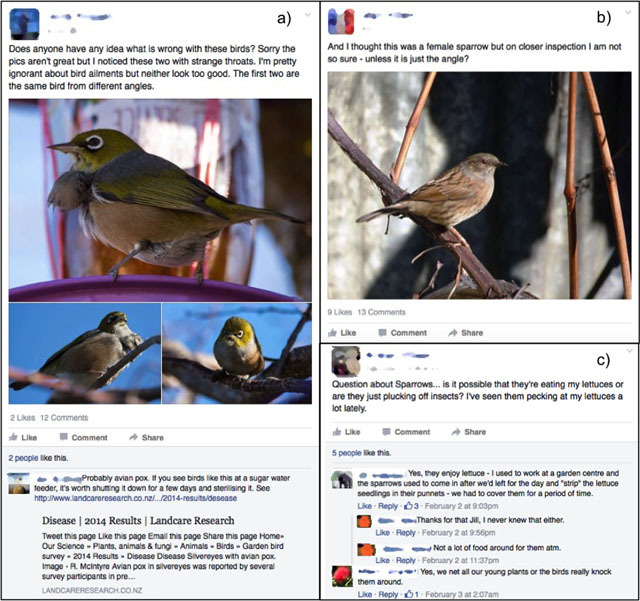 Help was requested for bird identification, and members shared survey results from their own gardens. Updates and results were disseminated by administrators via Facebook posts as they became available and after the survey had closed (Figure 6). Preliminary results from the 2015 NZ-GBS posted by administrators of the Facebook group. At another level, the group exhibits a rhythm that reflects seasonal changes (Figure 7). Some birds are more common in gardens during certain times of year and so become prominent points of discussion while they are present. In New Zealand, many people limit feeding to winter months, so discussion of food and feeder types are more common then. In the spring and summer months, topics switch to bird nests, chicks, and fledglings. Examples of seasonal NZ-GBS Facebook group posts from summer (a) and winter (b). Social media use has been linked to greater civic participation (Skoric et al. 2015; Zhang et al. 2010). The impacts of the Facebook group remain unknown for the short term. Anecdotal evidence indicates that the group attracted new participants to NZ-GBS. In a post-NZ-GBS questionnaire in 2017, 174 participants reported finding out about NZ-GBS through the NZ-GBS Facebook group (n = 2,525, 7% of questionnaire respondents). Ongoing study of the NZ-GBS Facebook group will provide insights into whether the group has affected participation of new and existing volunteers and will determine benefits of group membership. Examination of the three central characteristics and seven principles for cultivation of a CoP (Wenger et al. 2002) supports our contention that the NZ-GBS Facebook group is functioning as an active CoP. Members have used the group to share excitement, ideas, and knowledge about New Zealand garden birds. Facebook’s group structure allows for participants to interact amongst themselves, with little input necessary from administrators. Whereas in the past participants individually contacted NZ-GBS coordinators, the use of social media now provides opportunity for participants to interact with the community—something that was previously logistically difficult due to resource constraints and participants’ geographic spread. Time and further work will tell if social media can increase participation in NZ-GBS. It would be useful to examine social media based CoPs for other citizen science programs to understand whether the observations made within this group can be generalized to other countries, topics of research, and types of citizen science programs. Further research also could address whether participation in a CoP can provide training for novices and thus improve quality of data collected. The supportive nature and tone of the NZ-GBS Facebook group may contribute to its continued activity throughout the year. Another likely reason for the group’s ongoing activity is its engaging topic, with birds being an important feature of the cultural identity of New Zealanders (Kiwis) cultural identity. Identity, including values and attitudes, is an important determinant of people’s engagement with or use of information (Longnecker 2016). A citizen science project with a less-engaging area of focus might find it more challenging to support its participants in this way. Lessons learned from setting up a Facebook page to support a citizen science project include the importance of posting guidelines for conduct within the group, responding rapidly to inappropriate content, and maintaining administrator approval for all membership requests to minimize misuse and spam. We set the tone of the community from the start and provided examples of the types of interactions appropriate to the group. There is no way to know whether this was a contributing factor to the supportive and positive nature of this group. While some citizen science CoPs may benefit from a more hands-on approach to facilitation, we think that letting the community drive conversations within the group is important. Group members are able to express the value they find in the community to further reinforce its importance. Recommendations for others interested in creating a similar community are to choose a social media format that allows for direct interactions between participants. At present, Facebook was determined to be the most familiar platform that enabled multimedia sharing including photographs, video, and text. While not all participants of a citizen science project need to be active in the community, a range of individual experience and expertise will be more likely to encourage dialogue and peer-to-peer learning. The NZ-GBS Facebook group continues to be a lively, informative and supportive CoP. Ongoing research, including a questionnaire of NZ-GBS participants and content analysis of posts and comments from the Facebook group, will provide insight into what group members have learned, how and why they participate, and whether participation can lead to behavior change that might impact New Zealand’s garden birds. This work was conducted as part of a project entitled Building Trustworthy Biodiversity Indicators, with funding awarded to Landcare Research by the New Zealand Ministry of Business, Innovation and Employment (Contract No. C09X1308). We thank Landcare Research for hosting and supporting the NZ-GBS. We also thank all members of the NZ-GBS Facebook group, particularly the following photographers whose images appear in this paper’s figures: Sally Bain, Leigh Gillard, Diana Hilgert, Ruth Reid, PJ Renshaw, Janis Russell, Marion Skelton, Simon Smith and Anna Stevens. Adcorp, 2013. Social Media Statistics October 2013, Australia and New Zealand. 11 January 2013. Available at: http://www.adcorp.co.nz/news-blog/Social-Media-Statistics-October-2013,-Australia-an [Last accessed 5 July 2017]. Alender, B., 2016. Understanding volunteer motivations to participate in citizen science projects: A deeper look at water quality monitoring. Journal of Science Communication, 15(3): 1–19. Alexa, 2016. Top Sites in New Zealand. Available at: http://www.alexa.com/topsites/countries/NZ [Last accessed 1 June 2016]. Bateman, P., Gray, P. and Butler, B., 2006. Community commitment: How affect, obligation and necessity drive online behaviors. In: Twenty-seventh International Conference on Information Systems, 983–999. Milwaukee, WI. Crothers, C., Smith, P., Urale, P.W.B. and Bell, A., 2016. The Internet in New Zealand 2015. Institute of Culture, Discourse & Communication, Auckland University of Technology, Auckland, New Zealand. Available online at: wipnz.aut.ac.nz. Geoghegan, H., Dyke, A., Pateman, R., West, S. and Everett, G., 2016. Understanding motivations for citizen science. UK Environmental Obeservation Framework, Wiltshire, UK. Available online at: http://www.ukeof.org.uk/resources/citizen-science-resources/MotivationsforCSREPORTFINALMay2016.pdf [Last accessed 5 July 2017]. Gray, B., 2004. Informal Learning in an online community of practice. Journal of Distance Education, 19(1): 20–35. Grese, R.E., Kaplan, R., Ryan, R.L. and Buxton, J., 2000. Psychological benefits of volunteering in stewardship programs. In: Gobster, P.H. and Hull, R.B. (eds. ), Restoring nature: Perspectives from the social sciences and humanities, 265–280. Washington, D.C.: Island Press. Jennett, C. and Cox, A.L., 2014. Eight guidelines for designing virtual citizen science projects. In: Second AAAI Conference on Human Computation and Crowdsourcing, 16–17. Pittsburgh, PA. 3–4 November 2014. Jennett, C., Kloetzer, L., Schneider, D., Iacovides, I., Cox, A.L., Gold, M., Fuchs, B., Eveleigh, A., Mathieu, K., Ajani, Z. and Talsi, Y., 2016. Motivations, learning and creativity in online citizen science. Journal of Science Communication, 15(3): 1–23. Longnecker, N., 2016. An Integrated Model of Science Communication – More than Providing Evidence. Journal of Science Communication, 15(5): Y01. Masters, K., Oh, E.Y., Cox, J., Simmons, B., Lintott, C., Graham, G., Greenhill, A. and Holmes, K., 2016. Science learning via participation in online citizen science. Journal of Science Communication,. 15(3): A07. Mayes, T. and de Freitas, S., 2007. Learning and e-learning: the role of theory. In: Beetham, H. and Sharpe, R. (eds. ), Designing and delivering e-learning, Abingdon, Oxon, UK: Routledge. McCaffrey, R.E., 2005. Using Citizen Science in Urban Bird Studies. Urban Habitats, 3(1): 70–86. Nielsen, 2016. Nielsen Connected Consumer Report 2016. Roy, H.E., Pocock, M.J.O., Preston, C.D., Roy, D.B., Savage, J., Tweddle, J.C. and Robinson, L.D., 2012. Understanding Citizen Science & Environmental Monitoring. Final Report on behalf of UK-EOF. NERC Centre for Ecology & Hydrology and Natural History Museum. Salesforce.com Inc., 2013. Strategies for Effective Wall Posts: A Timeline Analysis. Available at: http://www.salesforcemarketingcloud.com/resources/ebooks/strategies-for-effective-wall-posts-a-timeline-analysis/ [Last accessed 23 June 2016]. Sociograph.io. Analytics for Facebook Groups and Pages. http://sociograph.io [Last accessed 5 July 2017]. Spurr, E.B., 2012. 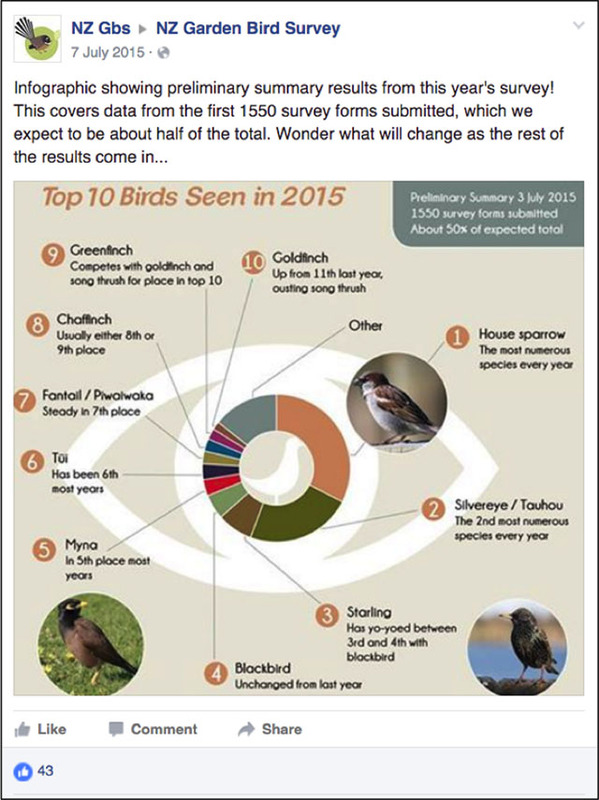 New Zealand Garden Bird Survey – analysis of the first four years. New Zealand Journal of Ecology, 36(3): 1–13. Star, P., 2002. Native bird protection, national identity and the rise of preservation in New Zealand to 1914. New Zealand Journal of History, 36(2): 123–136. Wenger, E., McDermott, R.A. and Snyder, W.M., 2002. Cultivating Communities of Practice: A Guide to Managing Knowledge. Boston, Massachusetts: Harvard Business Press. Wenger, E. and Wenger-Traynor, B., 2011. Levels of Participation. Available at: http://wenger-trayner.com/project/levels-of-participation/ [Last accessed 22 June 2016].